This insurance is optional and will meet the demands and needs of a UK resident requiring insurance for jewellery or watches in the United Kingdom, Channel Islands and Isle of Man plus up to 30 consecutive days elsewhere in the world any one trip. The insurance is administered by T H March & Co. Limited, Hare Park House, Yelverton Business Park, Yelverton, Devon, PL20 7LS, and they are authorised and regulated by the Financial Conduct Authority (FCA). This may be checked on the Financial Services Register on the FCA’s website. In the unlikely event that you may wish to make a complaint, this should be directed to T H March. The complaints procedure is detailed in your insurance documentation. It is important you read the certificate as this details the terms, conditions and any restrictions in cover. If you select an insurance option when placing your order, and decide you don't want the item, you must send back the item within 14 days of purchase so we are able to cancel your Insurance policy; please read our Returns & Exchange policy. Showing 2 of our total 3 reviews, with an average rating of 5 stars. 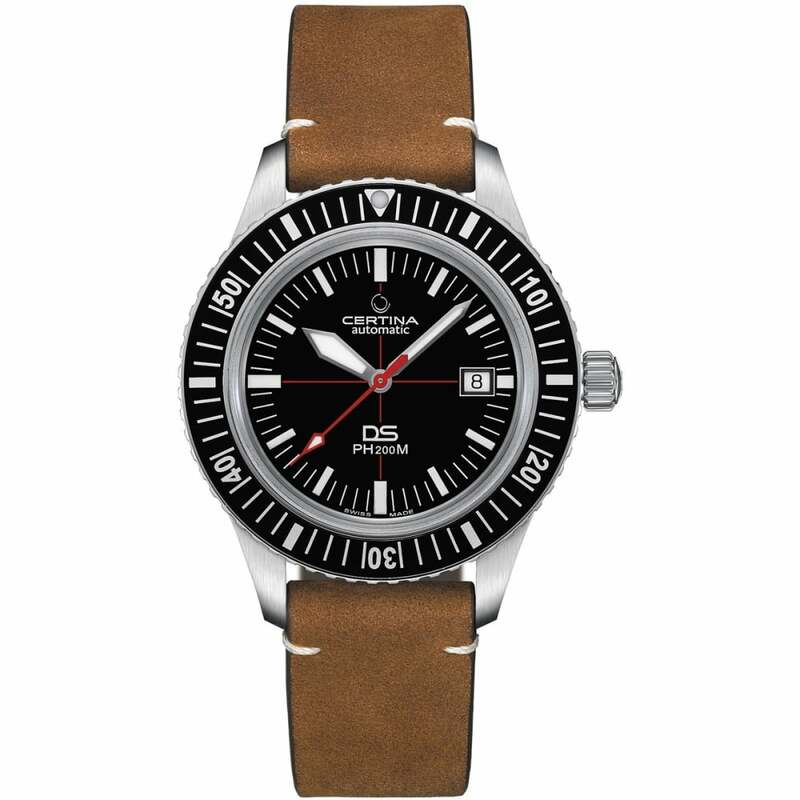 Read all 3 reviews for Certina Men's DS PH200M Heritage Automatic Leather Watch. Beautiful vintage looking watch that looks great on the wrist. Love it! Best reissue of 2018. Very good quality as expected from Certina. We have partnered with "V12" Retail Finance Limited, so we can offer you a more flexible and affordable way to pay for your order using finance. V12 is a leading UK specialist provider of Retail Point of Sale Credit, they have been offering finance options for more than 20 years through there industry leading paperless processing system for online retailers. If your application is successful, you will enter into a Credit Agreement with Secure Trust Bank Plc (V12's parent company) which will be administered by V12. V12 is authorised and regulated by the Financial Conduct Authority. Secure Trust Bank Plc is authorised by the Prudential Regulation Authority and regulated by the Financial Conduct Authority and the Prudential Regulation Authority under registration number 204550. 0% and classic APR Finance options are available on products / orders over £275.00, the finance plans available for each product varies depending on the items value and how much the item is discounted. A 10% minimum deposit will be required, for full details please read our Finance Information page. © 2019 Francis & Gaye Jewellers. All Rights Reserved.